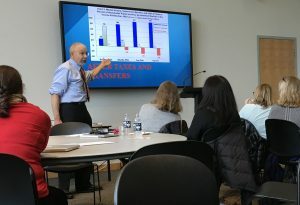 The Economics Department Early College Experience Program held its annual workshop for teachers on November 1 at the Storrs Campus. The workshop was attended by 25 teachers from high schools across the state who hold the positions of instructor and preceptor of economics responsible for teaching high school students Principles of Microeconomics (Economics 1201), Principles of Macroeconomics (Economics 1202) and Essentials of Economics (Economics 1000) in their high school. 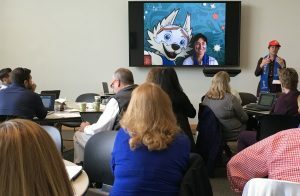 The teachers who attended, learned from a program they inspired by suggesting topics in the spring of 2018. 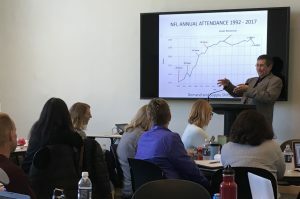 Highlights of this year’s program included Professor Nishith Prakash presenting his work entitled “Gender, Crime and Punishment”, which provided a peek at original economics research. The teachers were excited by this work and raised numerous questions. Professor Prakash’s paper was followed by a presentation by Professor Natalia Smirnova (a UConn Economics Ph.D.) entitled “Oligarchs and Ivans: A Changing Russian Economy 1990-2020” in which Professor Smirnova provided both background and predictions for the modern Russian Economy including a look forward. After continuing discussion the workshop was adjourned. Professor Prakash’s recent work on crime against women and all women police stations in India has been in the news. 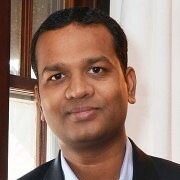 Most recently, Indian Express, a leading newspaper in India, interviewed him to discuss the economic effects of violence against women in a podcast prepared for United Nation, India. He also presented his latest work (joint with Sofia Amaral (ifo Institute) and Sonia Bhalotra (Essex)) “Gender, Crime and Punishment: Evidence from Women Police Stations in India” at the Urban Economics Association Conference at Columbia University and the North East Universities Development Consortium Conference at Cornell University in October, 2018. In this paper, the authors find that the presence of All Women Police Stations in India leads to more reporting of violence against women crime, in particular, female kidnappings and domestic violence. The study finds modest impact on the measures of police deterrence such as arrests. The American Economic Association has posted an interview with Karthik Muralidharan on “Cycling to School: Increasing Secondary School Enrollment for Girls in India“, the paper that he and Professor Nishith Prakash have published in the American Economic Journal: Applied Economics. This funding will supplement Professor Prakash’s project studying the impact of bicycles on female education and empowerment in Zambia. 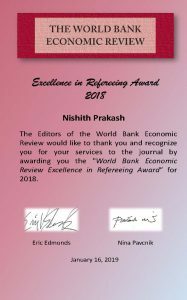 Professor Nishith Prakash presented his paper “Do Criminally Accused Politicians Affect Economic Outcomes? Evidence from India” at the 6th NCID Research Workshop in Madrid, and at the Universidad Carlos III de Madrid. Professor Nishith Prakash and his co-author Professor Kumar (Sam Houston State University) have had their paper titled “Effect of political decentralization and female leadership on institutional births and child mortality in Bihar” accepted for publication at Social Science & Medicine. In this paper, they investigate the impacts of political decentralization and women reservation in rural local governance on institutional births and child mortality in the state of Bihar in India. Using difference-in-differences methodology, they find a significant positive association between political decentralization and institutional births. They also find that the increased participation of women at local governance led to increased survival rate of children belonging to richer households. They argue that their results are consistent with female leaders having policy preference for women and child well-being. This project was funded by International Growth Center at London School of Economics (http://www.theigc.org). Professor Minkler and Professor Prakash’s paper titled “The Role of Constitutions on Poverty: A Cross-National Investigation” has been accepted by the Journal of Comparative Economics. In this paper, they construct and use a new historical data set on economics and social rights from the constitutions of 195 countries and an instrument variable strategy to answer two important questions. First, do economic and social rights provisions in constitutions reduce poverty, measured as headcount income and health outcomes? Second, does the strength of constitutional language of the economic and social rights matter? Constitutional provisions can be framed either more weakly as directive principles or more strongly as enforceable law. The results suggest three findings. First, they do not find an association between constitutional rights generally framed and poverty. Second, they do not find an association between economic and social rights framed as directive principles and poverty. Third, they do find a strong negative association between economic and social rights framed as enforceable law and poverty when we use legal origins as our IV. These results persist for indices of constitutional rights and also when they restrict the sample to non-OECD countries. The policy implication is that constitutional provisions framed as enforceable law provide effective meta-rules with incentives for policymakers to initiate, fund, monitor and enforce poverty reduction policies. Professor Nishith Prakash’s paper “Cycling to School: Increasing Secondary School Enrollment for Girls in India“, with Karthik Muralidharan, has been accepted for publication in the American Economic Journal: Applied Economics. In this paper, the authors “study the impact of an innovative program in the Indian state of Bihar that aimed to reduce the gender gap in secondary school enrollment by providing girls who continued to secondary school with a bicycle that would improve access to school. Using data from a large representative household survey, we employ a triple difference approach (using boys and the neighboring state of Jharkhand as comparison groups) and find that being in a cohort that was exposed to the Cycle program increased girls’ age-appropriate enrollment in secondary school by 32% and reduced the corresponding gender gap by 40%. We also find an 18% increase in the number of girls who appear for the high-stakes secondary school certificate exam, and a 12% increase in the number of girls who pass it. Parametric and non-parametric decompositions of the triple-difference estimate as a function of distance to the nearest secondary school show that the increases in enrollment mostly took place in villages that were further away from a secondary school, suggesting that the mechanism of impact was the reduction in the time and safety cost of school attendance made possible by the bicycle. Many countries worldwide have made significant progress towards gender equality in education, labor force participation, and political representation in recent decades. However, in many developing and less developed countries, there also exist discriminatory social norms that favor early marriage and limit girl’s access to education and labor force participation. Therefore, it is not surprising that reducing gender disparity in primary, secondary and tertiary education has been one of the most important goals for international education policy over the past decade, and has been enshrined as one of the United Nation’s Millennium Development Goals (MDG’s). In this experimental study we aim to study the impact of providing cycles to girls in grade 7 and 8 on education and empowerment. The aim of this evaluation is to estimate the impact of World Bicycle Relief’s BEEP program in Zambia, which provides access to cycles to students who live far from schools in their communities. The study proposes to rigorously test the impact of cycle distribution on education outcomes as well as outcomes pertaining to girls’ empowerment and their bargaining position in the households. 1) What is the impact of providing cycles to adolescent girls on education outcomes such as attendance, drop outs and examination scores? 2) What is the impact of providing cycles to adolescent girls on pregnancy, marriage, fertility, mobility, bargaining power, and empowerment?